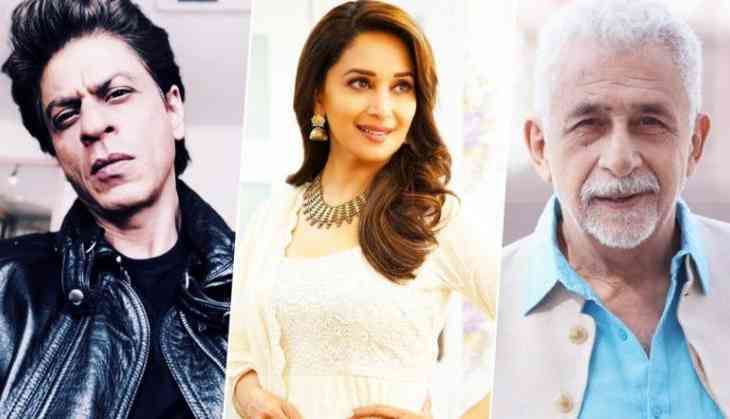 Bollywood's famous actors Shah Rukh Khan, Tabu and veteran actor Naseeruddin Shah are among 928 new members invited by the Academy of Motion Picture Arts and Sciences as the body behind the Oscars seeks to enhance diversity. In an announcement, the Academy said the new members will increase the diversity in a major way as 49% of its invitees are female and 38% are people of colour. Various artistes from 59 countries have been invited as members. From India female stars Tabu and Madhuri Dixit, Tabu’s Viraasat co-star Anil Kapoor and actor Ali Fazal are in the list of the new invitees. Veteran Bengali actors Soumitra Chatterjee (Bridge) and Madhabi Mukherjee (Charulata) are in the list of invitees. Yash Raj Films’ Aditya Chopra and producer Guneet Monga also feature in the list. Cinematograper Anil Mehta, best known for his work in Imtiaz Ali’s Rockstar, is also invited so are costume designers Dolly Ahluwalia and Manish Malhotra. Other names include Subrata Chakraborty and Amit Ray. Both of them worked in Haider . Dangal editor Ballu Saluja, musicians Usha Khanna and Sneha Khanwalkar of Gangs of Wasseypur represent India in the musicians section. Oscar-winner A R Rahman, actor Irrfan Khan, Amitabh Bachchan and Aamir Khan are already the Academy members. "Hey yo. I'm in The Academy," Pakistani-American Nanjiani, who co-wrote and starred in The Big Sick, tweeted Monday. His wife and co-writer Emily V. Gordon was also invited to join. Others celebrated elsewhere, like Tiffany Haddish, who got the news from Melissa McCarthy on the set of their upcoming film The Kitchen. "That super cool," Haddish said in a video capturing the moment. "So I get to vote?" Haddish added, before exclaiming with laughter: "I'm going to get movies for free?" On the other end of the age spectrum is 84-year-old Gosford Park actress Eileen Atkins. Other highly-recognisable invitees include Dave Chappelle, Jada Pinkett Smith, Amy Schumer, Christine Baranski, Sarah Silverman and Kyra Sedgwick. The Academy has been actively working to introduce more diversity in its voting to avoid a controversy like 2016 when the Oscars were dubbed “white” for failing to recognise talents of colour. The Harvey Weinstein sexual harassment scandal in October last year further shaped the narrative in Hollywood with women coming forward and demanding better representation through #MeToo and Time’s Up movements. The Academy seems to have taken these changes in consideration by diversifying its membership.